Made with the same quality and attention to detail as the Oak Tool Boxes, these Maple Tool Boxes offer a lighter, contemporary look over the traditional oak style. 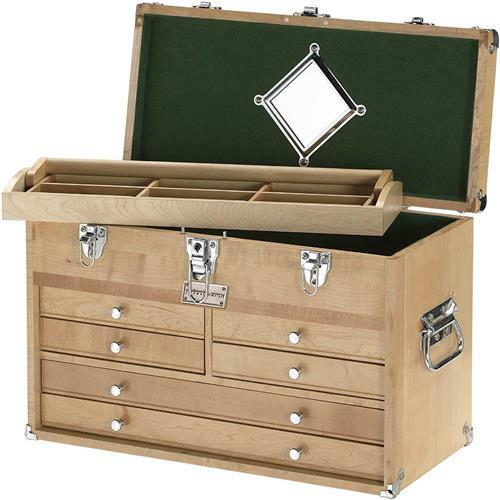 All of the basic features are the same, such as interlocking joints, locking panels and felt lined drawers, however this 6 Drawer Chest has a removable tool tray. You'll be proud to have this in your shop! Approximate shipping weight: 26 lbs. This product is well built and a good value. I found a defect after opening the package. I notified Grizzly and their response was excellent, definitely exceeding my expectation in handling the return/replacement. Great deal for the price, I bought a second one for my brother. There great. This is the second one I've purchased from Grizzly. As we add new equipment we will be adding these at each station for required tooling. They are perfect. Grizzly customer service is absolutely the best I have ever experienced. I ordered this Maple 6 drawer chest and it was delivered within just a couple of days. However, once I got the tool chest out the shipping box I realized it was damaged. It looked as if the shipper used it for batting practice. I contacted customer service and they were wonderful. They responded right away and arranged for a replacement unit, which arrived within two days and it is in PERFECT condition. Grizzly customer service dealt with the shipper, and they followed up with me every step of the way. 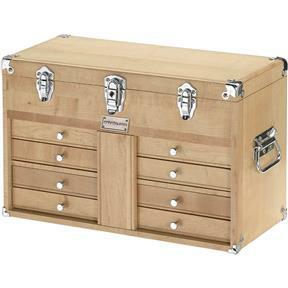 And for this price point, you really can't find a better deal on a maple tool chest. The product is beautiful, but it really is the the people that make this company a cut above all others!! They stand behind their product, they are helpful, and they are a joy to work with. I am extremely happy with my purchase and will always go to Grizzly before looking anywhere else! Thank you Grizzly!